I am thrilled to show you my projects for the last day of July Clear Dollar Stamps Sneak Peaks. 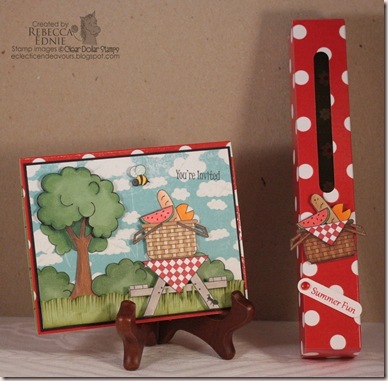 This set is perfect for all of those summer time picnic cards and scrap pages. 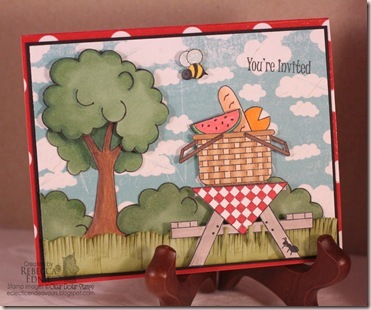 I had a fabulous time creating this fun picnic scene. The clouds are part of the BG paper but all the rest of the elements are from the set except the grass! This scene is multilayered with layers of foam dots. The tree trunk, lower leaves and bushes are at the back of the scene. Next are the grass and the food, at the front are the basket, table and table cloth. I cut the grass with fringe scissors I bought to cut up herbs but they worked fine here too! Be sure to visit Lori at Clearly iStamp to see the full set and links to more fabulous cards and projects using this and all the other new July sets! These will all be available at Clear Dollar Stamps starting July 1. Paper: DP-MME and stash, white CS-Taylored Expressions, celery, black CS-SU! Very creative…love the summer scene you created! OMG, this is such a wonderful set!!! What an absolutely adorable picnic scene and the little red sparkler box is sooo fun!! !